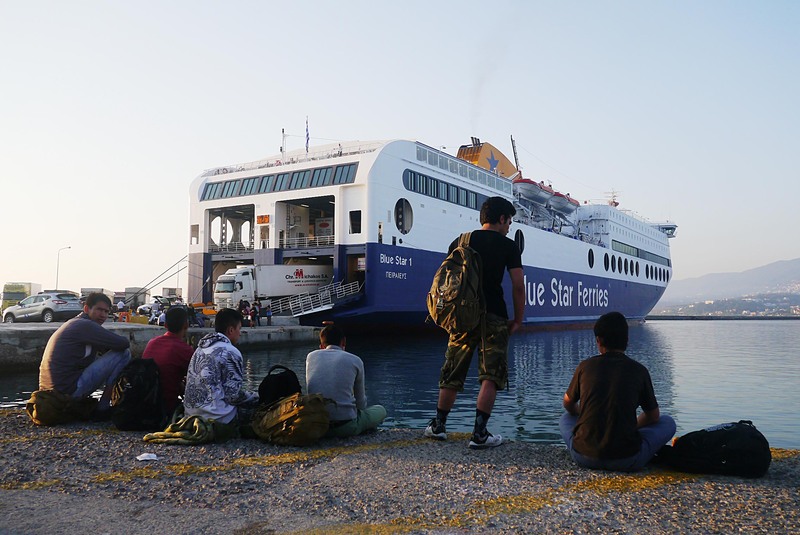 I took Saad and Hamid to Karlovassi for the Blue Star ferry to Piraeus at 1.45am yesterday. There are not so many people or cars there at this time. Immediately we entered the port area 2 young port police in black jump suits approach us and ask for our papers and tickets. They pulled us over to one side and begin to go through their ID papers and my passport. The boat arrives and starts to load. We still wait but we after 15 minutes we are now afraid of missing the boat. They won’t tell us why we are treated like this. He just walks around us speaking on his phone. The passenger gang plank is raised and we are at the bottom of the ramp as the remaining lorries board. As the last lorry approached us at the ramp a pair of legs could be seen hanging down near the wheels. The police screamed for the lorry to stop which it did and this teenage boy dropped to the ground. Thankfully not injured. At that very moment the police gave us our papers and told us we could go. Saad and Hamid scrambled up the ramp and the boat left. I go to see 2 friends off and all three of us are treated like criminals. I suspect few passengers if any saw or took notice and yet this is going on before their eyes. And then there was the lad falling from the lorry. He could have been killed. All he wanted was to get to Athens. And as well as this, when we were first pulled over the police were with a young refugee lad maybe 14 -16 and telling him to go away that he was not getting on the ferry. All I could hear him saying is that I’ve got papers and tickets and I am going to my parents who are waiting in Athens. I don’t know what happened as they moved us away. But later I did see the lad from the lorry limping away from the port. The police did not hold him. He was alone, with no bag, summer sandals and a tee shirt. He was abandoned. This is Samos, October 2017. Encounters like this are commonplace now at the two ports. When the ferries are due to leave the ports are alive with officials, some in uniform others in plain clothes. No two sets of uniforms look the same. Some are from Greece others from Germany, Italy and other EU states. Some are clearly special forces given all the armour and weapons they carry. Not only are the refugees physically separated from the other ‘regular’ passengers but they endure an entirely different boarding procedure where they have to prove their right to travel. Every time our refugee friends want to visit Samos from Athens this is what they have to endure. Both coming and going. It is a process saturated with suspicion on the part of the officials. There is a total absence of respect. This is Samos. Many here choose not to see any of this.